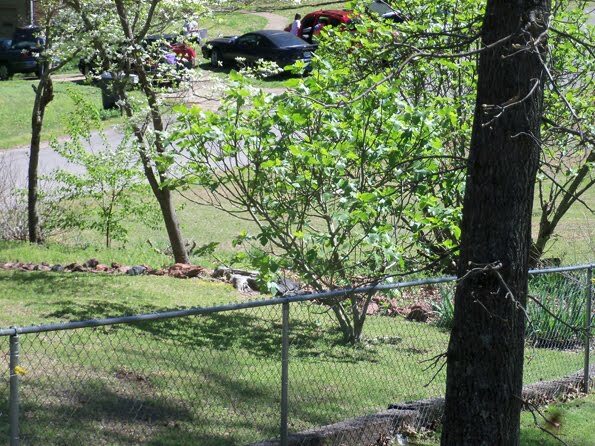 Dogwoods are blooming in my side yard. So beautiful! Plus, it means the bluegills are on their beds—time to go fishing! See our little fig tree in the side yard? You'd be surprised by how many figs the tree produces for its size. It cross pollinates with a larger tree that's kind of hidden behind it in this photo. We recently had a lot of repair work done on our back deck, including the addition of this gate, which blocks passage down the steps to the yard. Our cats are indoor cats, but we wanted to be able to let them come out on the deck with us when we start container gardening there, or when we're just outside enjoying the day. You can see Tempe, our little black female cat, sitting by the gate. But we can't close it in, because that's how the dogs get from inside to the yard outside. Hence the gate. Open for dogs, closed for cats. Here's another view of the deck repairs. 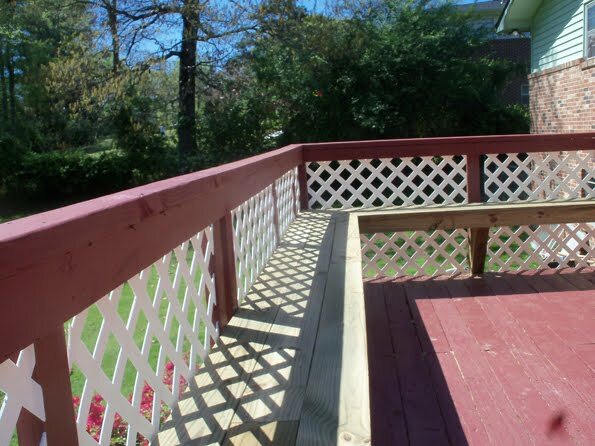 We had the lattice added to make the area more contained than it was before, which will make it easier to keep the cats on the deck. 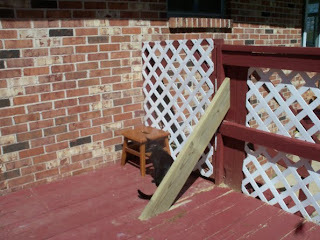 Also, our handyman built us this bench that extends the width of the deck and down one side to the house. It'll be good for both sitting and for placing our container garden containers. What about y'all? Has spring arrived where you are? What are your favorite signs of the new season? 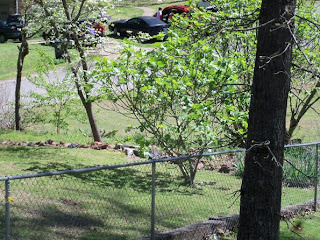 I love all the colors—green leaves, blooming azaleas, daffodils, dogwoods, redbuds, pear trees, magnolias, tulips. But I sure don't love the pollen, which makes me miserable all season. I went to visit a friend who lives in Palestine (that's in Texas) which has a dogwood festival every year. They have a very large park which has what is called the dogwood trail so people can drive through it and see all the blooming dogwoods. And speaking of pollen they also have a rural home with lots of pine trees. By the time I left my red car had turned yellow from the pollen!!!! Most plants don't do well under my care so I really have very few. I love the redbuds and magnolias as well as azaleas. Want a preview of Hitched and Hunted?